Need active retention on your holster due to a department restriction or duty use, etc? Add a thumb break to your Statureman Custom Holster! The Statureman Thumb Break version 2.0 is made with the same hi-strength coated material as our IWB Soft Loops and utilizes a Mil-Spec Pull the Dot Snap. 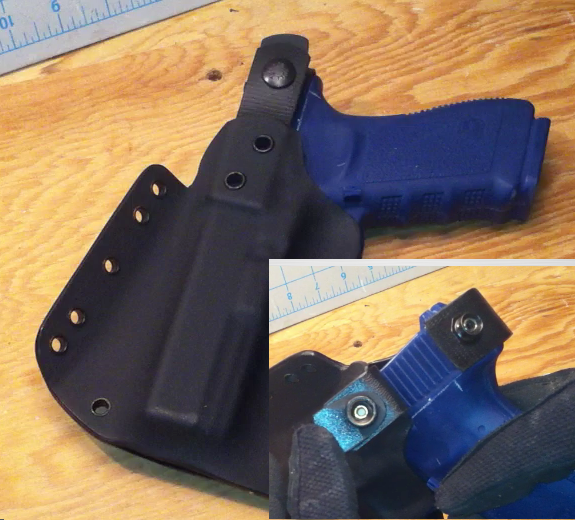 The holster will also fully retain the pistol with the snap disengaged. Most of our lineup can have a thumb break installed. Note: The thumb break is molded into the holster when the holster is first made, so it is not possible to add after the fact. <--The quick-release tab makes breaking the snap very easy. Kydex Duty Holsters by Statureman Custom Holsters. 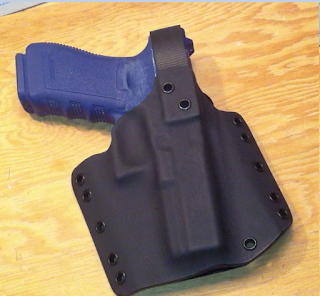 Kydex Duty holster will fulfill police department requirements for active retentionon your holster. The Statureman Custom Holster, Statureman Light-Bearing, or even StatureMini can accommodate a thumb break. If you are looking for Kydex duty gear you can find it here!